By the beginning of the 14th century Prague was already a hub of European commerce, a centre of rich and diverse cultures and Bohemia was the most powerful state in the Holy Roman Empire. With the renaissance sweeping through Europe and an enlightened and visionary king in the making, Prague was poised for its first “Golden Age”. The last male in the Premyslid line died in 1306, bringing and end to the rule of Bohemia’s founding dynasty. A new era began and a new dynasty was founded when Eliska Premyslova, sister of the last Premyslid, ruler married John of Luxembourg. King John was a modest and humble man, a quiet achiever who, during his brief and unspectacular reign, continued the work of the Premyslids. The legal status of the towns of Mala Strana and Stare Mesto were strengthened and in 1320 a new town, Hradcany, was created from the settlement around Prague Castle Square. The cornerstone of Prague’s cathedral was laid and in 1344 Pope Clement VI promoted Prague’s bishopric to an archbishopric. However, John of Luxembourg’s greatest work and the one into which he poured the most vision and wisdom, was the education and the preparation of his eldest son, Charles, for his role as sovereign. Charles acceded to the throne on the death of his father in 1346. He was thirty years old, and set for a spectacular reign in a rich and powerful kingdom. He wasted no time. It had been John of Luxembourg’s ambition to transform Prague into a second Rome and Charles dutifully carried out his father’s programme. On April 7, 1348, he established the region’s first university. 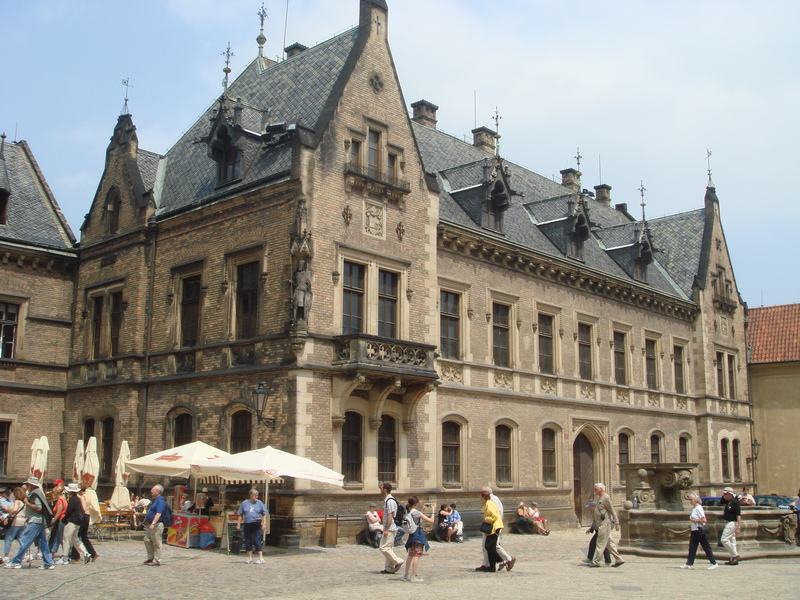 Known today as the Charles University, it is the oldest in the Czech Republic. In the same year he founded Nove Mesto, the New Town, a modern town of over 360 hectares, surrounding the Old Town. 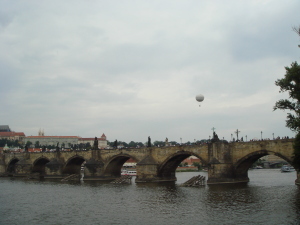 He rebuilt Prague Castle and Vysehrad and erected the beautiful Charles Bridge, today almost an emblem of the city of Prague, to replace the old Judith Bridge. Construction was begun on St Vitus Cathedral and many new churches were completed. In 1355 Charles was crowned Emperor of the Holy Roman Empire in Rome and Prague became its capital. By now Charles had his own ambitions for the city. He wanted it to be the most beautiful in the world, with Prague Castle as its centrepiece and St Vitus Cathedral dominating the skyline. Construction boomed. Grand, elaborate Gothic architecture replaced the relatively simple Romanesque style and a unique, new Bohemian kind of decoration evolved. Art, culture and commerce flourished. These were golden days for Prague and the Czech lands were among the most powerful in Europe. Even today, there is little of the city which does not bear King Charles’ stamp. Explore the masterpieces of the era with a walk across the Charles Bridge, around Prague Castle and through the New Town. Sometime in the 7th century a Princess named Libuse married a humble ploughman named Premysil. Together they founded the great Premyslid dynasty which was to build the city of Prague and reign over Bohemia for almost six centuries. In 880, Prince Borivoj Premislovec laid the foundations for the city of Libuse’s vision when he built Prague Castle, on a hill on the left bank of the Vltava. A new town was established below the castle, at the shallow crossing points over the Vltava River, where long trade routes converged. By the early 10th century it had developed into an important multi-cultural trading centre, where merchants from all over Europe gathered. In 863, the evangelists Cyril and Methodius, (aka, the apostles of the Slavs) baptised Borivoj and his wife Ludmila and Bohemia became a Christian country. Filled with religious zeal, Borivoj began a programme of building, beginning with the Church of our Lady and following with the Basilica of St George. The next great Premyslid ruler was Borivij’s grandson, Wenceslas. In his reign more churches were built, including St Vitus Rotunda, on the site where St Vitus Cathedral now stands. Under Wenceslas Prague began to emerge as the centre of Bohemia. Meanwhile, an alliance with the neighbouring German Saxon dynasty strengthened Bohemia’s position in the region. On September 28, 929, Wenceslas was assassinated by his brother Boreslav, who opposed the German Alliance. Wenceslas was buried in St Vitus Rotunda. He was later canonised and became Bohemia’s most famous and beloved patron Saint. In 950, after many years of warfare, Otto I of the Saxon Dynasty defeated Boreslav and Bohemia came under the sway of the Holy Roman Empire. In 1085 King Vratislav I was crowned as the first Czech King. Despite his regal status, he remained subordinate to the Holy Roman Empire and the German king. Vratisalav set up a second principality at Vysehrad across the river and built a road to connect it to an old Romanesque fort further along the right bank. During the 11th century, this old fort, today’s Stare Mesto, or old town, began to expand back from the riverbank and to centre around the large marketplace now known as Staromestske Namesti or the Old Town Square. When Jewish merchants began to set up businesses, Prague’s Jewish quarter was established. The Old New Syngogue was built and the first souls were laid to rest in the Jewish Cemetery. In 1212 a Papal Bull (the Golden Bull of Sicily) decreed Bohemia a Hereditary Kingdom with Prince Premysil Otakar I as Regent. Under his rule a programme of peaceful colonisation began and the Germans, who were to live harmoniously among the Czechs for over 200 years, arrived. The small settlements which comprised Prague grew apace and, in 1230, Stare Mesto gained the status of a town. In 1257, Premysl Otakar II took the throne. He founded Prague’s Mala Strana or Lesser Town, on the left bank of the Vltava and invited colonists from Northern Germany to settle there. By the end of the 13th century, he was the most powerful King in the Holy Roman Empire. Known as the Iron and Golden King he ruled in seven other countries and his reign extended form Silesia to the Adriatic coast. By 1303, the male line of the Premysild rulers had died out but Prague was already a great and beautiful city of majestic castles, grand buildings and magnificent churches. Its settlements had grown into prosperous towns. Merchants and traders came from all over the world to do business here. It was well on the way to becoming the vast, glorious city of Princess Libuse’s vision. While much of Mediaeval Prague has been demolished or disappeared under subsequent layers of bricks and mortar, much of it still remains. Uncover the Prague of the Premyslid Dynasty with a walk through Stare Mesto, the Jewish Quarter, around the area where the Charles Bridge meets the right bank of the Vltava, through Mala Strana and around Prague Castle.